The American Psychiatric Nurses Association (APNA) is now accepting abstracts for presentation at the APNA 32nd Annual Conference, October 24-27, 2018 in Columbus, Ohio. Submissions will be accepted through March 5, 2018. I encourage my nursing colleagues to use this open call for abstracts to showcase their important contributions to the population’s mental health. APNA is soliciting abstract proposals for both podium and poster presentations that address all levels of psychiatric-mental health nursing administration, education, practice, research, and more for the APNA 32nd Annual Conference. 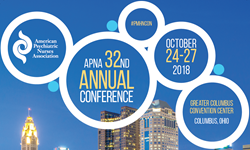 The APNA Annual Conference will deliver hundreds of evidence-based podium and poster presentations to the1600+ nurses and advanced practice nurses (RN and APRN). Nurses from varied backgrounds are invited to share their research, practice innovations, clinical expertise, and more by submitting an abstract online by March 5th at 11:59 Eastern. Many options are available to organizations interested in participating in the APNA 32nd Annual Conference, including industry-sponsored symposia, sponsorship and advertising opportunities, promotional product theaters, and exhibits in the Exhibit Hall. Visit http://www.apna.org/AnnualConference for more information.